Clinton is the largest and third oldest of the state's 70 facilities. It opened 153 years ago in frontier wilderness as a mining prison. But it would become the site of some of the most creative programming offered within the Department of Correctional Services. New York tended for years to send its toughest customers to "Little Siberia." That was both because its experienced staff was up to the task and because transfer to an institution 320 miles from New York City and with only two seasons - winter and July - was seen by inmates as a punishment. The northern climate was responsible for several of Clinton's unique programs. Until tuberculosis was apparently vanquished in the 1960s, Clinton served as the Department's TB treatment center. And winter recreational activities in the North Yard - skiing, skijumping and bobsledding - have struck observers as so incongruous in a prison that they have been featured in privately produced documentary films. Clinton was conceived in economic protest. With the perfection of the "Auburn System" of prison management, New York finally achieved the dream of correctional managers throughout the United States: a prison industrial system capable of factory efficiency whose revenues from sales could offset the costs of running the institution. But not all taxpayers were thrilled. New York's "mechanics" - craftsmen and artisans, who often owned their own businesses - saw industrial production at Auburn and Sing Sing as unfair competition. By the 1830s, they were noisily demonstrating and raining petitions on the Legislature. . . . In 1835, the besieged lawmakers tried a compromise to placate the mechanics without scuttling the promising prison industrial scheme. An act was passed limiting the number of inmates working in a prison shop, but an exception allowed unlimited numbers of initiates to be assigned to the manufacture of articles usually imported from abroad. Auburn and Sing Sing vainly experimented with silk production and the manufacture of cutlery and brussels carpets. The 1935 act failed to quell labor unrest. An 1842 act tightened restrictions. This ski run is no longer operational during the long winter season at Clinton. Like its predeessor of seven years earlier, the 1842 act also sought ways to compete with foreign rather than domestic labor. It provided for study of an idea proposed by a Keesville resident: that prisoners be employed in iron mines in Clinton and Essex counties. Most iron was imported, and prison miners would be removed from competition with free and honest citizens . . . . Ransom Cook, a Saratoga County inventor and jack-of-all-trades, was commissioned to survey the North Country mineral regions and obtain proposals for the sale of mines. Cook recommended a site near the Saranac River, 17 miles west of Plattsburgh. In 1844, the Legislature passed an act for the establishment of a prison "for the purpose of employing the ... convicts in mining, and the manufacture of iron; together with the manufacture of such articles from iron as are principally imported from foreign countries." A total of $17,500 was used to buy the mine and 200 acres of land. 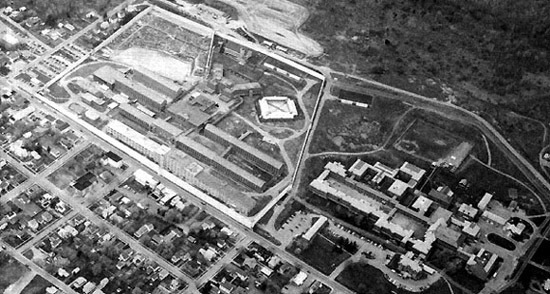 Cook, appointed to find the site, became interested in the prison project and took the liberty of including in his report recommendations for the building of the institution. He was then appointed Clinton's first "warden and agent" and commenced stockading a yard about the first of February. . . .
By June, temporary buildings for officers, guards, workmen and convicts were in place. On June 3, 1845, Clinton's first 50 prisoners arrived in shackles, ankle-chains and stripes, bedraggled after the walk from Plattsburgh. The 17-mile road was described as "bad, worse, worst:" an almost uninterrupted ascent of 1,330 feet through deep sand, broken rocks and water-worn gullies. Three weeks later, 44 convicts arrived from Auburn. Cook had traveled to Sing Sing and Auburn to personally select the first prisoners and he looked for robust health and physical strength. With their arrival, the work of building the prison proceeded quickly. Within a year and a half, ground was broken and leveled, foundations sunk and water brought into the yard. 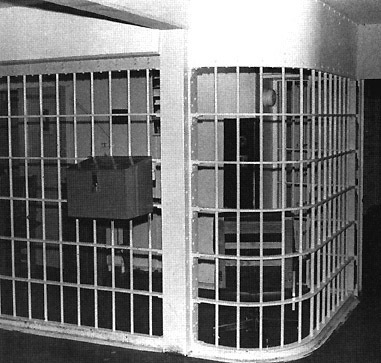 A section of the first cell block was made ready for occupancy. Other buildings were also erected including a kitchen, a blacksmith shop, a steam saw mill, ore buildings and an iron and brass foundry. "Tools and implements" to make their own steam engines and other machinery were obtained, and the Lyon Mountain mine was opened and drained. Cook accomplished much in his three years at Clinton. He built a new prison in the wilderness, largely with convict labor. He laid the plan for the prison's industrial base. Two of his own inventions, a steam powered forge and an "electro-magnetic ore separator," were used at the prison. He also instilled a guiding philosophy, and it was in sharp contrast to earlier prison traditions. Cook thought prisoners should be treated kindly. This photo shows the entrance to Upper F Block at Clinton. "Much more is requisite in a keeper," he wrote, "than a capacity for goading an ox, or beating a horse. . . . Keepers should possess tact, kindness, intelligence, finnness and self-possession." Initially, prisoners were shackled in heavy chains at all times. While this encumbrance deterred escapes, it also hampered their work. Cook thus substituted lighter chains. Seeing that the prisoners did not take advantage, Cook soon dispensed altogether with shackles and chains during the day. "As no bad consequences followed and the moral sense of the convicts seemed to be still progressing," he finally removed the chains that had been used, before the cells were ready, to secure them to the floor at night. Punishments were used when necessary. Men were placed in dungeons for periods ranging from a few hours to a month. Some were whipped, while others were placed on bread and water for short periods. In one punishment, Cook's scientific bent can be detected: on March 9, 1846: a convict charged with insolence and assaulting an officer was subjected to "small shocks of electricity" which, however, were reported to have "produced but little effect." Cook did not remain long enough to make much headway on the scheme to mine iron ore. On January 31, 1848, he was replaced by George Throop, one of three inspectors appointed by new legislation to unify the administration of the three state prisons. It is doubtful if Cook's continuance would have made a success of New York's experiment. The locale was too remote from major markets, and reliance on the 17-mile plank road added to the cost of materials and goods. (The railroad line from Plattsburgh was not completed until 1879). The supposedly "inexhaustible" prison-owned mine began to give out early, and the state was forced to pay heavy rents to work adjacent lands. In 1876, prison inspectors declared that "the manufacture of iron and nails at Clinton Prison has proved a disastrous failure as a financial undertaking." In 1877, the mining experiment was abandoned. The mines were filled with water for reservoirs, and inmates were put to work producing shoes, barrels, wooden ware, brushes, brooms, baskets and "such other articles as can be easily made here, for use in the other prisons of the state." It was hoped that the "state use" system - later incorporated in the new state constitution of 1894 - would put an end to private sector objections to prison labor. The 50 years following the end of the mining experiment saw Clinton develop into one of the largest and most diversified correctional institutions in the country. A total of 656 cells were built between 1879 and 1881, more than doubling the originally planned capacity. In 1887, a concrete wall replaced the old wooden palisade. Damage from a major fire in 1890 was offset by new construction including a state shop, a hospital, a 50-by-100 foot bath house, a "factory building" and a new mess hall. 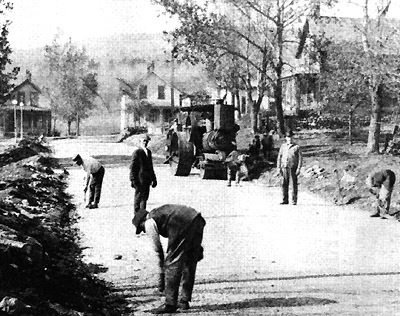 Clinton inmates repave Dannemora's Smith Street in 1902. Also constructed was a combination auditorium/chapel where, starting in 1919, "moving pictures" were shown to the population on Saturday afternoons. In 1926, a new 65-by300-foot, three-story shop building of concrete and steel replaced a building destroyed in a 1922 fire. The first mention of tuberculosis occurs in Clinton's annual report for 1862, when "quite a number of consumptive cases" were noted. By 1876, the institution physician reports several recoveries, due in his opinion to "the healthfulness of our location." Beginning in 1889, other prisons were sending their tuberculosis cases to Clinton. A special 40-bed ward was added to Clinton's hospital in 1901 and another 100-bed ward opened in 1907. Eleven years later, construction of a separate TB hospital was completed on a high plateau at the rear of the prison. In addition to the tubercular, Clinton would also specialize in "incorrigible" prisoners. A new scheme of 1897 classified inmates by number of offenses; Clinton received the worst, those with three or more felony convictions. Beginning in 1914, the scheme was abandoned in favor of a classification based on the inmate's adjustment in prison. Again, Clinton was designated to receive the most difficult prisoners. In 1899, the Dannemora State Hospital (D SH), built by prison staff and inmates, opened next door. Separately administered, DSH would provide custody and treatment for all male prisoners declared insane after conviction. Meanwhile, Matteawan would hold males insane before conviction and females in both categories. A little known chapter in Clinton's history opened in 1910. That's when 25 prisoners were housed in an abandoned stone farmhouse eight miles from the prison while they built a road in the vicinity of Morrisonville. Clinton's use of inmates for road building, forestry and conservation continued for 40 years, anticipating the official creation of correctional camps in the late 1950s. The "road gangs" were professionalized in the 1930s when Warden Thomas Murphy hired college graduates in forestry, agriculture and engineering as "guard instructors." On July 22, 1929, a major riot erupted at Clinton. After breakfast, convicts in the yard refused to go to the workshops, then turned on the officers. One convict was shot dead as he attempted to kill an officer and two others were killed trying to escape over the wall. The inmates broke windows and machinery and set fires causing $50,000 in property loss. Investigations into the Clinton riot and two riots that same year at Auburn brought calls for reform. Emphasis was placed on rehabilitative programs. Warden Murphy appointed guard instructors and also began requiring inmates to attend school half a day. Another result was the nearly complete rebuilding of the institution. . . . In 1941, the Church of St. Dismas, the Good Thief and Patron of the Condemned, was dedicated. This Catholic chapel, of Gothic architecture, was constructed of Adirondack granite with inmate labor and is listed in both the State and National Registers of Historic Places. 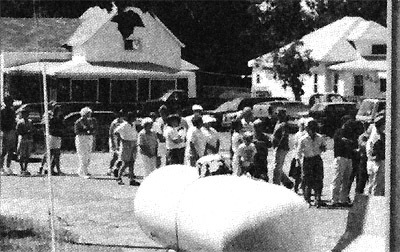 Thousands of New Yorkers turned out to tour Clinton during its 150th anniversary celebration in 1995. Court decisions in the 1960s required a higher level of due process to transfer an inmate to a prison mental hospital and prohibited retention beyond their maximum expiration date. As a result, the DSH census began to shrink. DSH made space available to the adjacent prison, which introduced an experimental Diagnostic and Treatment Center using a team treatment approach and supervised inmate government. In 1972, the last 300 DSH patients were transferred to Matteawan. The hospital grounds were converted into a new facility - still independent of Clinton - called the Adirondack Correctional Treatment and Evaluation Center (ACTEC). ACTEC initiated several creative treatment concepts ranging from therapeutic communities to token economies. ACTEC's staffing did not survive budget cutbacks. It closed in 1975, and its grounds and buildings were annexed to Clinton. Clinton Annex maintained the DSH/ACTEC site's treatment tradition. The Merle Cooper program was introduced in 1977 for inmates who have trouble adjusting to incarceration. . . . to deal with inmates' real or imagined fears of other inmates, and to transition them into the general population. 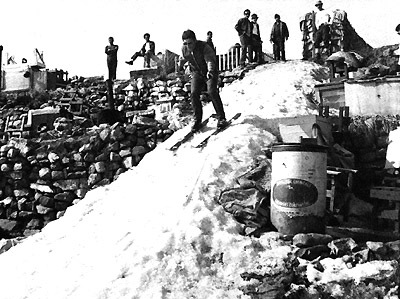 Because Clinton is built on the side of a mountain, the hillside accounted for unique skiing activity in winter. It also accounts for another unique Clinton tradition. Small areas of the hillside are used as "courts," which groups of inmates call their own and where they gather to socialize, cook and eat, play cards, chess and checkers, and grow flower and vegetable gardens. The 300 established courts range in size from nine square feet to 25-by-50 feet and accommodate up to six men. The hillside crowded with courts has often been likened to a hobo jungle. The courts had their origins "in the rights of a few squatters," but their use has for years been sanctioned by facility officials. The court system is seen as playing a key role in the social structure of Clinton's 2,900 inmates and the management of this large population. . . . Some 450 inmates assigned to Clinton's Corcraft industrial program manufacture inmate clothing for DOCS and the New York City Department of Corrections, and Class B uniforms for DOCS Correction Officers. The Garment Shop also produces clothing for residents of the facilities operated by the Office of Mental Health and the Division for Youth. In 1989, Clinton was the 19th New York state correctional facility to be accredited by the ACA and will soon undergo its fourth reaccreditation audit. Return to menu listing NYCHS excerpts of DOCS|TODAY Facility Profiles. Return to NYCHS home page..
NYCHS is honored to be permitted to present these excerpts from the Facility Profile: Clinton article appearing in the January 1999 issue of DOCS|TODAY. All rights to the text and images remain with DOCS. To access 2003 on-line issues in Adobe Acrobat format (PDF), including the unabridged Facility Profile articles, visit the DOCS|TODAY menu page on the DOCS web site by clicking on the logo above.